We were in Greece from the 20th Dec 2002 to 6th March 2003. We entered Greece by the ferry from Bari to Igoumenitsa and went first to Corfu. 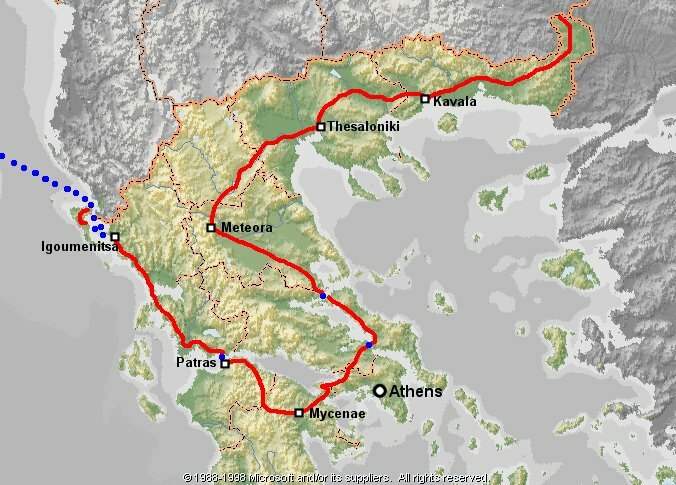 Then we cycled down the west coast to cross the Gulf of Corinth at Rio (near Patras), across the Peleponnese to Mycenae, then north by Corinth to Thessaloniki and then east to cross into Bulgaria at the NE corner of Greece. We really liked Greece. It was of course winter time so things may not be the same in summer, but we found the people friendly, the roads surprisingly quiet (outside of Athens) and the landscape beautiful. The food is good and cheaper than Britain, both in restaurants ("tavernas") and supermarkets (they have Lidl here too!). Hotels were cheap too by EU standards, usually we paid just 25 euros a night for a room. The language is rather difficult, particularly as the alphabet is different of course, and you do need a basic command of it if you are going to do your shopping in a remote mountain village. 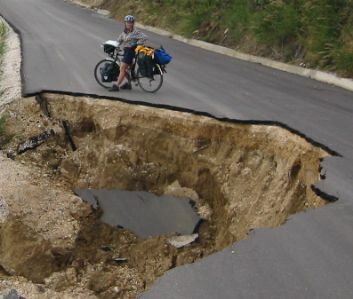 The road network is not at all bad. There is a quite recent map series that marks the main roads as either thin or thick red lines and we found that as long as we avoided the thick red roads the traffic was never excessive. There is a good network of surfaced minor roads and even more unsurfaced roads. The maps are accurate regarding the unsurfaced roads but tend to be a gross simplification of the unsurfaced road network. Also in winter the unsurfaced roads can be very muddy (or covered in snow! ), but from spring to autumn I think you could have a lot of fun touring off road. Hills can be steep and large, but the maps have contours so it is easy to see what you are letting yourself in for. Although we had some very good days in December and January, there was also so pretty wild wet weather so I couldn't really recommend going then. February was unremitting cold and we had problems with snow. 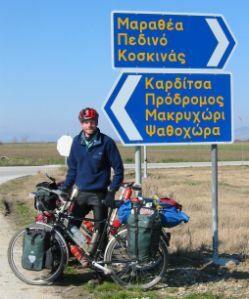 I am told that (and I believe it) April, May, October and November would be good months for cycle touring. The summer itself is terribly hot. Athens has at least one really good bike shop. It is on the western side of Patisson, about ten yards back from the street in a sort of arcade. You pass two inferior bike shops before it so don't stop until you get there! Thessaloniki has at least two bike shops, one on Langadha which sells few spares, just complete bikes. The other is near Irakliou, it has a vast stock, all of it at least twenty years old. I bought a new tyre which lasted me two days. Good luck!